In this month I am doing several presentations of the Dutch version of my book Queen of the Vatican. It’s quite special to do this in combination with walking the heart labyrinth. On the photo above you see me walking it for the first time, in De Schaapshoeve, a beautiful spiritual centre in the Netherlands. Together with Dafne Arlman I designed this portable labyrinth, using some of the beautiful graphic work that she made for the book. The labyrinth itself is styled after the heart labyrinth that we made under Matilda’s castle in Canossa, il cuore di Matilda. 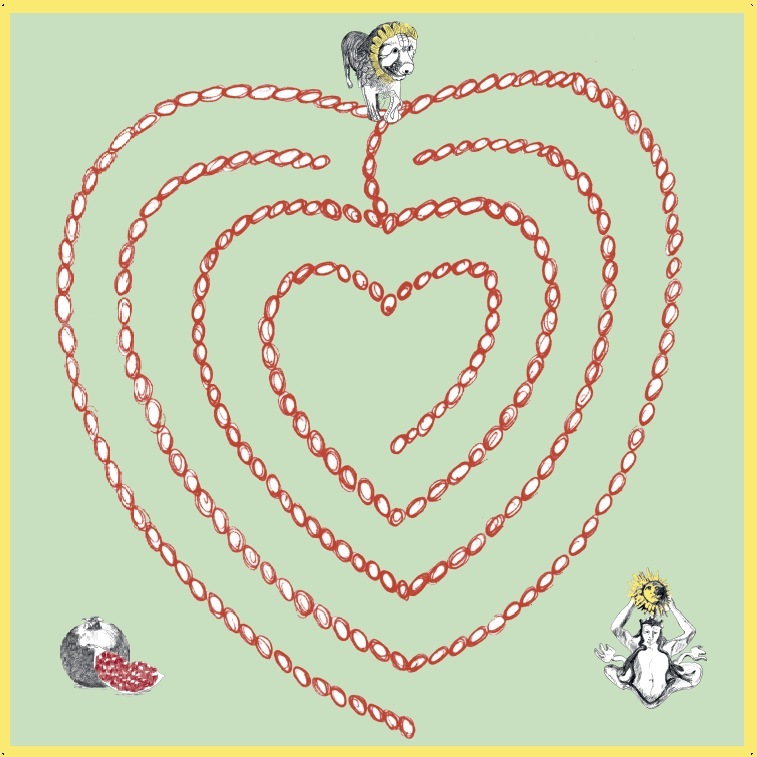 But we colored the lines in red so that while walking to the heart in the centre you can connect to the pits of Matilda’s pomegranate, symbols of love and abundance. At the entrance there is shining pomegranate to bring you in the mood. And then, on the top of the heart stands the lion. While walking the labyrinth you pass by him/her several times. As you can read in the last chapter of my book, the lion appeared in my dreams just before we initiated Matilda’s heart labyrinth in Canossa in july 2014. He is the guardian of the new age, and invites the walker of the heart labyrinth along a passage through the gate towards the new consciousness. I am looking forward to do many workshops with this labyrinth in the next years, both in the Netherlands and in Italy, honoring Matilda and the prophecy of her life! The labyrinth is sized 5 x 5 meter, so I can use it in relatively small places.